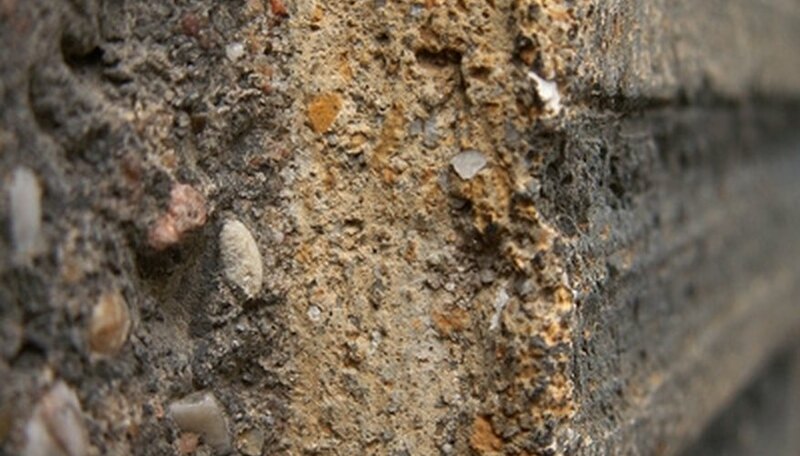 The edges and corners of a foundation slab of concrete are the areas most vulnerable to breakage. When a section breaks off from the slab, it not only detracts from the look of the slab, it also lowers the structural integrity. Repairing such a break requires that you create a corner that fits to the slab as strongly as the original did. This can be done through the use of a wooden form, built directly against the broken portion of the concrete foundation. Once the form has been properly built and prepared, you can pour in a patch that will bind with the existing concrete. This will create a new corner just as strong as the original. Wear a pair of safety goggles to protect your eyes from flying stone chips and dust. Remove any loose concrete located on the broken foundation corner. Chip away slightly loose stone with a cold chisel and a hammer. Drill three holes, 2 inches deep into the foundation, evenly spaced along the broken foundation edge. Using the hammer, sink the 4-inch pins into the holes. These pins will help to reinforce the concrete when it's been poured after placing the form. Clear away any dust or debris created thus far so that the wood when placed sits flush against the concrete foundation. Measure the height of the foundation and obtain wood planks of the same height and long enough to stretch the length of the missing concrete on each edge plus 12 inches. Place the planks along the foundation edges so that they join at the point where your corner will end. Place concrete blocks along the planks to hold them in place. Line the planks completely with the blocks to stabilize the planks and keep them from bowing when the concrete has been poured. The planks will serve as your form for pouring the concrete. Check the level of the planks using the carpenter's level to ensure that the top of the planks are level with the foundation. Adjust the planks if necessary. Once level, the patch will be ready for pouring.